Professor Reza Emami at the inauguration of the NanoSat Lab. 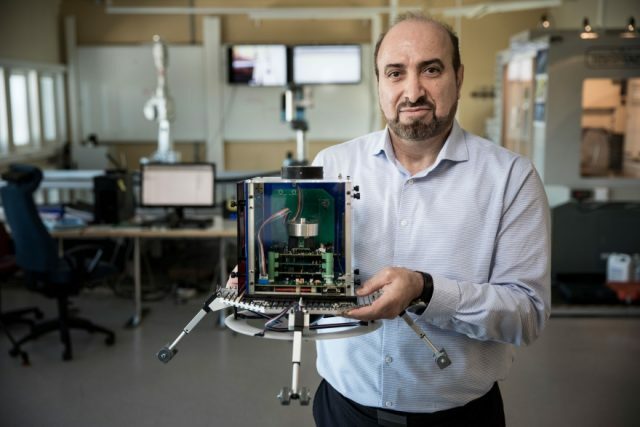 NanoSat Lab is Luleå University of Technology’s lab for design, testing and development of space systems onboard different types of spacecrafts. In the lab, which was inaugurated in April 2018, small satellites, so-called cube satellites, will be designed, developed, manufactured and tested. The aim is to be able to send up whole “fleets” of cube satellites for different purposes, such as climate monitoring and communication systems, or to allow satellites to map space in search of asteroids suitable for mining.